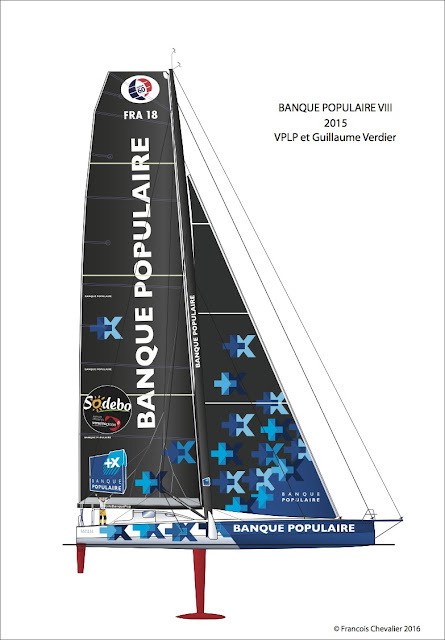 VENDEE GLOBE CHALLENGE 2016-2017: YACHT DESIGN... Banque Populaire VIII & Hugo Boss ! The one who wins is the best, no one will doubt it. However, in a solo round the world, there may be so many unforeseen parameters or parameters independent of the qualities of the sailboat, that one will attribute the victory to one who has made the most of all the circumstances, including those totally independent of his will. So, Bravo to Armel Le Cléac’h on Banque Populaire VIII! Yet, the second, Alex Thomson on Hugo Boss, was not unworthy, and his performance remains remarkable. 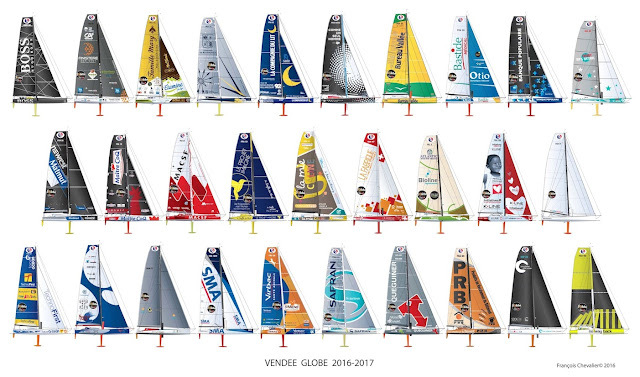 During the Vendée Globe, architects’ communications on the IMOCA foils suggested that the loners used them only parsimoniously, while the first four were equipped and pranced at the head of the fleet. Knowing that the sailboat is lightening on its foil, it seems obvious that it uses it as soon as it can. But this is not particularly true for foils, which do not have the same shape on the first two podiums, but the striking difference between the two hulls. One might have thought that the two sailboats, ordered by the architects VPLP and Guillaume Verdier would be close to the point of leaving the same mold. However, it is not. 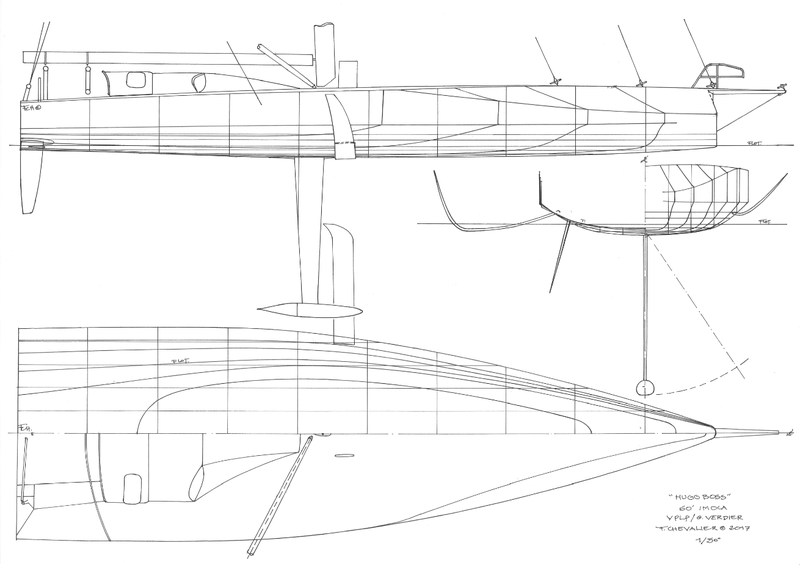 Satisfied, Alex Thomson wanted an extreme hull, but Armel Le Cléac’h certainly did not ask to design anything but a hull to win. A first observation of the two sailboats at the time of their reversal test can reveal a number of remarks. Banque Populaire VIII is wider, obviously, about twenty centimeters. This may seem light as a difference, compared to Hugo Boss’s 5.60 meters, but it remains noticeable, and one reaches peaks. The sight of the back of the hull of Armel’s sailboat in the basin on the edge shows a small redan, reminiscent of a certain Pen Duick V and the good finds of Eric Tabarly, followed by a curve tense to finish gently in the center of the transom. Given the speeds attained, the inspiration of the high speeds of the speedboats cannot be a bad idea. If one turns a little along the axis of the sailboat, one finds that the bottom of the hull is practically horizontal on a first part, forming a curved line before descending in a practically rectilinear way to the axis of the keel. We are very far from the generous back shapes of our cruising sailboats! 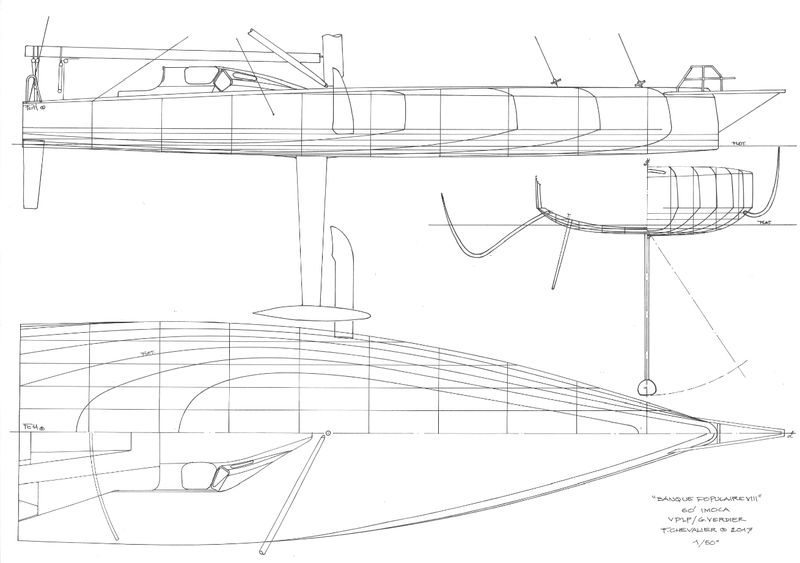 But this characteristic, coming from the catamaran hull of sport, is not new, and since the Cheminée Poujoulat of Bernard Stam, designed by Juan Kouyoumdjian, the 60-foot IMOCA benefits. While we are on the stern, admiring the softness of these curves, the hull above the chine is slightly inclined downwards, offering a more efficient carrying plane to the heel. This part, which runs along the length of the hull, a little domed, becomes vertical in its central part, and reverses up to the front to rejoin the inverted part of the stem. On the front half, the sheer line is widely rounded over twenty-five centimeters thick. Everything helps to reduce the shocks of the waves despite an enormous reserve of buoyancy at the level of the chine. This also reduces the development of the surface of the hull and deck, to decrease the weight of the whole. 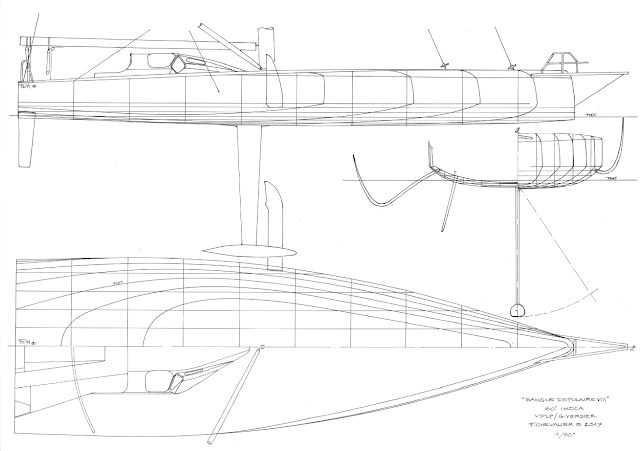 The keel, properly so called, under the chine, is fairly regular over its whole length, with a broad flotation and curved bottoms, favoring a diminution of the surface wetted at the heel, and planing forms at bearing paces. Nothing to say about the round bow, limited and imposed by the new IMOCA rule. The water lines, seen above the deck plane, all converge from two fifths of the length rectilinearly on the stem in order to present the minimum resistance to forward travel. A hull that resembles her skipper, crafty and agile. 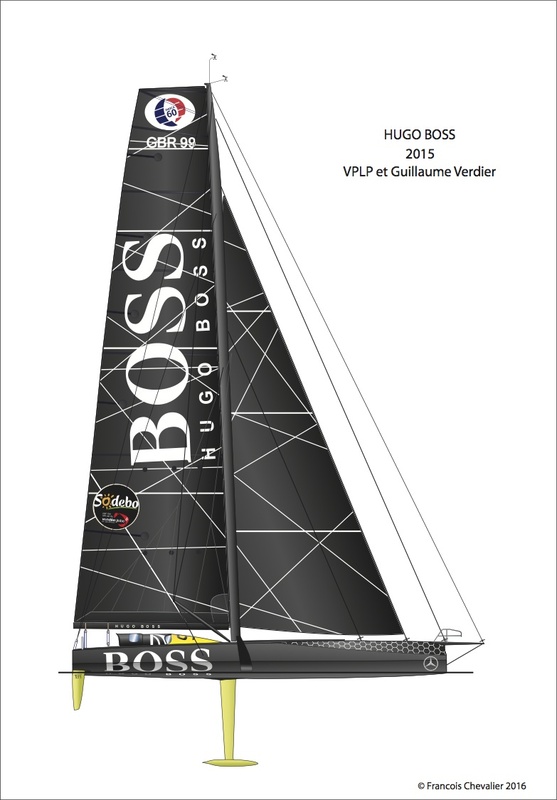 Alex Thomson's racer, Hugo Boss, is a bit like the image that the navigator presents us willingly, determined and tenacious. The complexity of the shapes of its mount proves that it is also reflected! What a hull. Cut with a knife, cut in the quick! A vertical plane running from front to rear, truncated at the front by a recessed sheer line, which dips towards the stem, a rear hanging flat at the heel, and flat bottoms on the front to initiate this planning as quickly as possible, a small cant under the chine in the front to repel the spray, and create an ejection rail. A shell narrower than that of Armel, but where efficiency and speed research are gross foundry. Alex testified as soon as his first outings, it seemed to him that the sailboat slipped under his feet!